Week 12 of the NFL regular season schedule has been completed, giving us an even larger sample size to delve into just how each of the 2018 NFL Draft first-round picks has fared in their respective action so far. Some of the 32 first-rounders have not qualified for a grade either based on small snap counts or not playing altogether. On the other hand, some players have jumped out of the screen and have helped strengthen their teams. After a couple of rough outings earlier in the season, the first overall pick is now back to his very best. In his team’s Week 12 victory over the Bengals, Mayfield completed 19-of-26 pass attempts for 258 yards and four touchdowns and helped his team to its first road win since October 2015. 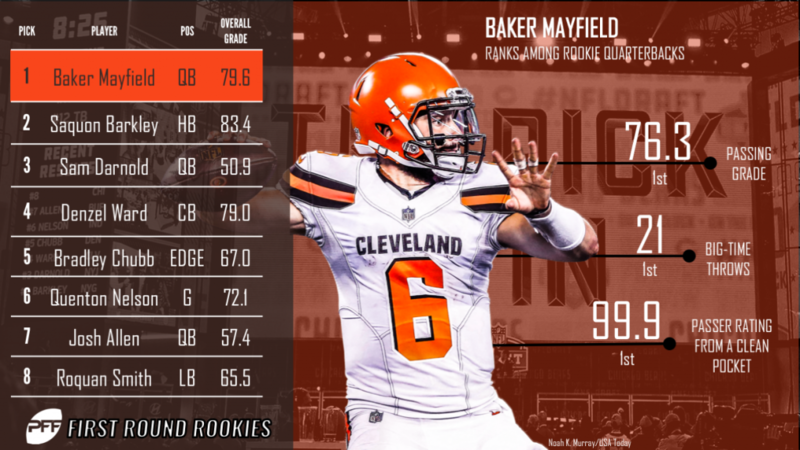 Over the last two weeks, Mayfield has amassed a passer rating of 143.9 on throws from a clean pocket – the best marks among all quarterbacks in that span. Barkley was up to his usual tricks in Week 12. He made defenders miss in the backfield, in the hole and at the second level, and when he needed to, he put on the jets to outrun them all to the end zone for a play that is featured on our plays of the week. Barkley racked up 101 yards from 13 carries, with 88 yards coming after contact via five forced missed tackles. For good measure, he also added seven catches for a further 41 yards and a touchdown in the passing game. His overall game grade of 84.6 is the highest mark of his career to date. Ward returned from his Week 11 bye to play one of his best coverage games of the season in Week 12. He was targeted nine times on the day, but allowed just three receptions for 23 yards, with 12 of those yards coming from one catch. Ward allowed a passer rating of just 42.4 on throws into his coverage on the afternoon, which was his best single-game mark since Week 5. Chubb had a rough time against Alejandro Villanueva and the Steelers offensive line in Week 12. He failed to record a single pressure on any of his 46 pass-rushing snaps, and he left the game with just a tackle and a tackle assist to his name.